When was the last time you were able to say you went to a casino that has a difference scenic view from your window each day? With Freestyle Cruising, you’ll discover something you won’t find on other cruise lines – freedom. Freestyle Cruising offers diverse and exciting restaurants, a more relaxed dress code and more things to see and do. They’ve designed the entire cruise experience around giving you the option to choose. With Freestyle Cruising, you travel a world of dining options all in one week. From elegant French bistros and Italian trattorias to sushi and tapas bars, and more, there’s a different dining option for almost every night of the cruise. And there are no fixed seating times. Imagine restaurants open from 5:30 to midnight so that you can choose from an early dinner before the show or a late romantic dinner for two. NCL prides itself on bringing you the best entertainment – Broadway shows, dazzling nightclubs, and a variety of bars and lounges. There are childrens’ programs, even a dining area just for kids on many of the ships. The Internet Café keeps you connected (if you must!) equipped with the latest hi-tech computers and online services. The impressive Art Auctions on board are not to be missed. There are all kinds of activities aimed at challenging your mind as well as your body, including a fitness center and The Mandara Spa. Do everything or simply do nothing at all – and then of course, there is always the casino! Every Mandara Spa & Salon is a haven of serenity and natural beauty, created for those seeking to relax, restore and rejuvenate body, mind and spirit. Filled with the intoxicating aromas of spices, fragrant flowers, and pure essential oils, every spa is a paradise for the senses. Mandara Spa offers a full menu of spa and salon services including hair and skin care, wraps, facials and massages including the Hot Stone Heaven and Mandara’s Spa’s signature treatment, the Mandara Four Hand Massage – the ultimate indulgence. NCL Casinos would rival any land-based properties and has a Casino Player Program that is just as competitive. Chances are, any game you would wish to play is available. NCL is the first cruise line to offer membership rewards that can earn players “comps” onboard or for future cruises. 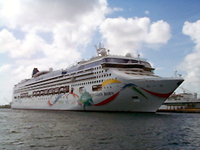 The membership club is currently operating on Norwegian Dawn, Norwegian Star, Norwegian Sun, and Spirit, and on all future new ships as they come in to service and will be spread fleet wide by fall, 2005. Casino credit lines are available for the Casinos at Sea Program. Featuring Blackjack, Craps (3X 4X 5X Odds), Mini Baccarat, Oasis Poker, Let it Ride, Roulette, Casino War and 3 Card Poker. Game variety varies on each ship (and available on request – need prior approvals) and can include Big Baccarat, Mini Baccarat – Squeeze Game, Pai Gow Poker, Pai Gow Tiles, and Single Zero Roulette. Casinos at Sea has been rated “The Best of Gaming” on a Cruise Line from the readers of Casino Player and Strictly Slots Magazines.